The new exposition titled Space, Color and Movement (Prostor, barva a pohyb) continues from the Photographic Studio exhibit, displaying photographic techniques. Building on that exhibit allowed us to expand the exhibition of photography into new areas: reconstruction of space perception, capturing color pictures and capturing motion, shown in this new part. In the latter half of the 19th century, stereoscopic photographs became widespread, filling an important function in news, entertainment and education. The exhibit acquaints visitors with both current and historical methods of spatial photography. 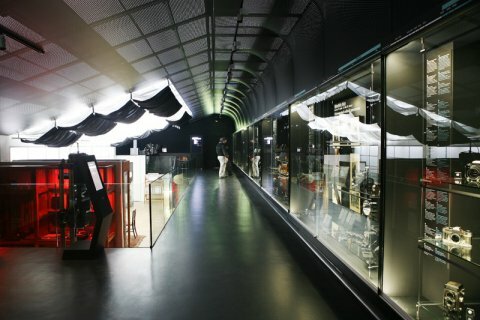 The exposition also displays all basic chemical processes of color photography, as well as principles of color imaging in digital photography. It is possible to experiment with the principles of color perception in the interactive part of the exhibit. The exhibit also documents the development of photographic capturing of motion. It shows the phenomenon of candid photographs, and visitors can photograph themselves in various stages of movement, using a set of eighteen cameras set up for serial photography, as was done in the 19th century. The phenomenon of moving pictures is documented by the original camera of the Lumiér brothers, with which Jan Knížecký shot the first Czech films.